Marine Survey New Zealand ensures your boat will be seaworthy and Insurable. Defects often seen in boats..
CLICK IMAGE TO VIEW LARGER ..
​​The thought of osmosis in a GRP vessel can be a shadow hanging over a purchaser of their dream boat. Osmosis is a highly contensious issue, often misunderstood and considered one that many people make dire predictions or throw away comments that have no relevance or logic. ​The gelcoat is a semi permeble membrane (lets in water). Water is the solvent on the outside of the hull. Water will migrate through the gelcoat into laminate voids. In these voids there may be uncurred resin, styrene, binders, or other solute left over from the build process. when this water dissolves the solute, it produces a hightly concentrated soulution. The water in which the vessel is floating attempts to equalise the concentration in the voids by passing into the gelcoat. This process happens much faster in fresh or warm water. As the resulting moisture absorbtion and laminate breakdown progresses, the volume of solution in the laminate increases and takes on a higher moleculer weight than the original moisture. This fluid therefore cant escape the gelcoat (as the water the vessel is floating in tries to equalise the soulution), blisters can then appear due to hydrulic pressure. Osmosis is not a cause, it is an effect, therefore it is irreversiable. If a hull has osmosis, irrespective of what is done, the chances are at some point in time further osmosis will appear. This is because the defects that are driving the osmosis are hydroscopic; they will readily absorb moisture and even if the water is removed, unless these substances are themselves removed, moisture will return. Unless the complete hull is changed, these defects remain. ​It may be found where water collects, for example where aluminium windows are fitted in a steel hull or when copper wiring is exposed in the bilge of an aluminium boat. In this case, fitting a rubber flange will help slow the process. 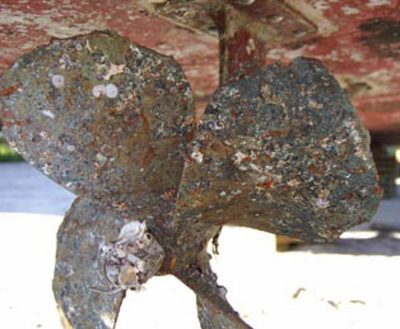 Underwater, galvanic corrosion will occur where brass seacocks are fitted in a steel hull or a bronze propeller is fitted to a steel shaft. Aluminium alloys are typically low on the potential scale and are particularly sensitive to galvanic corrosion in the presence of a wide number of other metals and alloys. 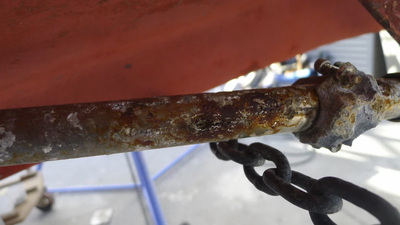 Stray Current Corrosion (aka Electrolysis) is similar to galvanic corrosion, but is caused when there is a source of potential difference external to the boat. This may be from adjacent jetties fitted with electrical power supplies or adjacent boats. It can be caused by poor isolation or insulation of electric cables or supplies allowing a ‘stray’ current. It is most frequently caused by the direct current (DC) circuits on board, produced by batteries and solar panels. The results are most marked when boats are left moored or berthed for extended periods and the fitting of battery isolation switches is important. Typically it occurs when the earth system of an adjacent boat is improperly set-up or when the insulation breaks down on cables passing through water in the bilge. Connection to shore power with inadequate protection is another source of problems. A ‘galvanic isolator’ should be fitted in the earth line of an on-board shore power installation. This is designed to ensure that the potential of the boats earth and associated anodes is at the same potential as the adjacent jetty fittings. Many small boats have inadequate shore supply arrangements which have been made up from domestic components and extension leads. These should be inspected with a view to their suitability in terms of stray currents as well as electrical safety. Domestic/automotive battery chargers can cause particular difficulties owing to the fact that their wiring often combines the negative/earth cables. This can in itself alter the earth potential adversely and cause corrosion on the host and adjacent boats. 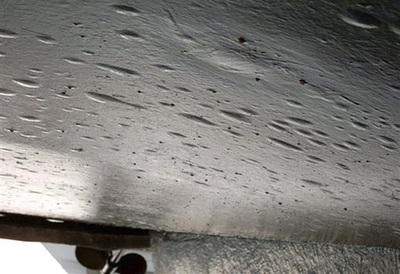 Protection against these forms of electrical corrosion below the waterline is achieved by earth bonding of susceptible components and fitting sacrificial anodes. Earth bonding involves connecting the items such as ‘P’ brackets, keel and seacocks internally to the negative battery terminal. The aim is to ensure that all the exposed items are at the same potential with relation to each other. In reality there are still likely to be some slight differences or components which by size shape or position remain vulnerable. Further protection is provided by fitting sacrificial anodes which are also connected to the negative terminal of the battery. They are cast in metal low in the order on the galvanic table. 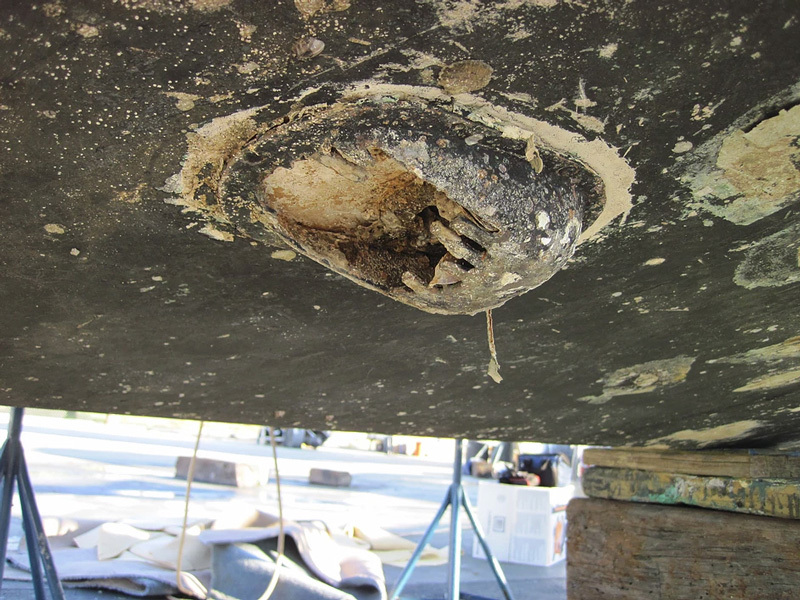 As the basest metal attached to the vessel, the sacrificial anode will deteriorate before the other metal components or hull. Magnesium anodes are fitted to boats used in fresh water and zinc anodes for those used in sea water. For those with a mixed fresh / sea water use, an aluminium alloy is generally used. Aluminium or steel hulled racing yachts may have portable external anodes suspended on wires while alongside. 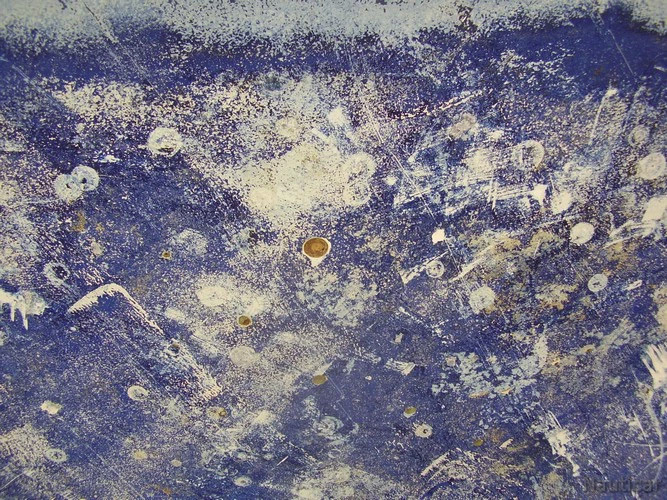 Rapid erosion of the sacrificial anodes is often the first indication of stray currents. Towler, P (2013) Diploma in Yacht and Small Craft Surveying. Surveying Steel and Aluminium Yachts. ​Electrolysis only occurs on boats when there is a ground fault and it is leaking current, usually from bad wiring. Small current leaks are commonplace and are rapidly dissipated in surrounding metals without doing damage. Larger current leaks, as when a significant part of a large conductor has a ground fault, can produce very damaging corrosion. 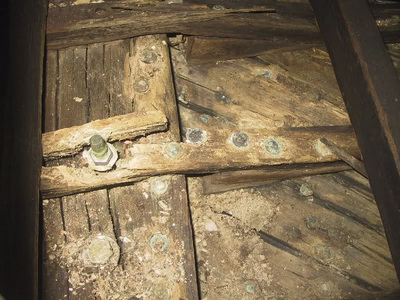 In timber vessels, a weakening is commonly observed in the wood that surrounds corroding metal, such as nails, screws and bolts. Wet wood not only causes metals to corrode because wood is slightly acid, but when a metal fastener is embedded in wet wood, certain conditions are created that can accelerate the corrosion of the metal. The corrosion products often can result in slow deterioration of the wood surrounding the metal. 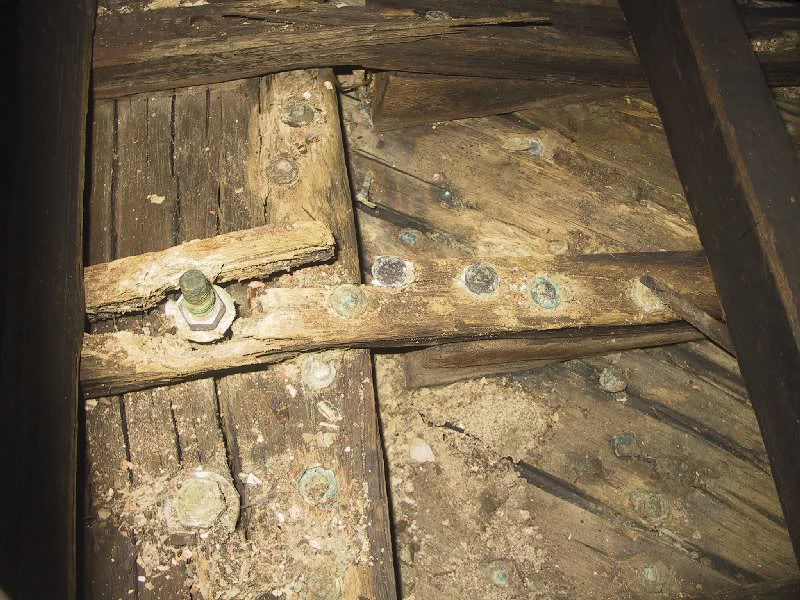 Corrosion of the fastener with deterioration of the wood causes loss of strength to the joint and to the structural integrity of the assembly. The wood that surrounds the fastener is usually stained black. 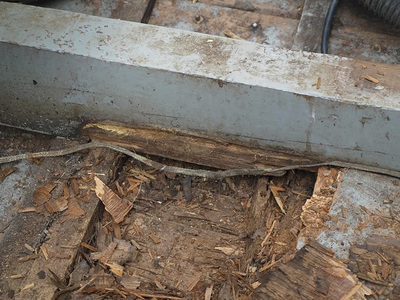 After corrosion has progressed, the shank of the fastener under the surface of the wood will corrode away. Wooden vessels are said to have “nail sickness” because of weakened wood around metal fasteners and fittings. The number and the placement of the sacrificial anodes should be carefully considered so that the metal is not “overprotected,” which could result in excessive amounts of alkaline cathode reaction products, causing wood degradation.